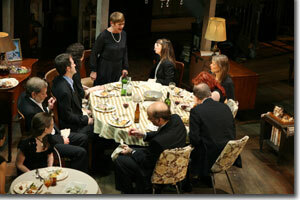 Not every Pulitzer Prize- and Tony Award-winning play turns out to have a long shelf life. The true test begins when the play goes on the road, which is the case as August: Osage County opens its national road tour in Denver. Despite some key variances, mostly in the first act, from what we saw in NYC (which was, essentially, the original Chicago cast), the touring production is a confirmation of the power of Tracy Lett's script. Nevertheless, before this production moves to San Francisco for its first national reviews, it would be worthwhile for director Anna D. Shapiro to consider a couple of modifications. First, with Beverly's (Jon DeVries) opening monologue. Lett's initial salvo is an incredible literary discourse that deserves the utmost focus; however, DeVries' overly elongated vowels, quirky beats, odd marginalized blocking (facing left from stage left), and a sound system that overamps every time the gruff patriarch punches a phrase, all serve as distractions from the transcendent monologue that provides the context for the action. Dialect and drunkeness in the theatre work best when they are representational, not realistic, yet following DeVries's stretch, Parsons' Violet pushes the envelope even further, with a drawn out drawl and inebriated indications that border on caricature. 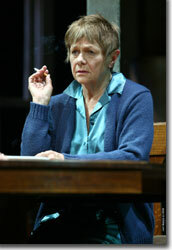 Thankfully, after that, the characters settle into the murky, inbred confluence of Lett's dysfunctional undercurrents. This is strong stuff and not all theatregoers are up to the task, just as, in a tamer day, Who's Afraid of Virginia Woolf? drove some out the doors at intermission and got the trustees of Columbia University to embargo Albee's Pulitzer. Those in denial of the ravages of unbridled profiteering on American society may take offense at Lett's brutal honesty, though, like Albee, his commentary may seem tame in the not too distant future, if humankind doesn't choose a sustainable evolutionary course. Each and every of the thirteen actors is remarkable: you'll remember every character; a baker's dozen of tasty morsels that connect contemporary American theatre with Eugene O'Neill, Arthur Miller, and Tennessee Williams.